Getting a free Bible is pretty simple these days. With these 7 suggested places to look, you can probably find one quickly. If you are in need of a Bible, don’t hesitate to ask a church for what you need. They will be more than willing to provide a copy of the Word of God and offer other spiritual guidance as necessary. Most churches would be glad to give you a Bible if you would just ask for one. It may not be a new Bible, but good churches are not going to deny someone a copy of the Word of God if they have the ability to get you one. Some churches may have requirements for receiving a new Bible, but they probably have used ones that they will give away. A church I recently worked with required that someone attend 3 weeks in a row to get a good quality, brand new Bible. However, if you just showed up and said you were searching for the truth and wanted a Bible to read, they would give you one without the 3 week commitment. There are a great number of websites where you can read the Bible online. The advantage to these sites is that you can choose various translations in different languages. One of my favorite sites for reading online is Bible Gateway. They have Bibles in more than 50 different languages. Another favorite site is Blue Letter Bible. Beyond various Bible options they have study tools that will help you get a better understanding of what you are reading. To study the Bible by topic check out this online Topical Bible resource here at What Christians Want To Know. There are many software packages you can download and use on your computer to read the Bible. Like the online Bibles you can read various versions and have study tools at your fingertips. Many of these are completely free for the text of the Bible but may require a small fee for some of the more advanced study aids. Many smartphones have free Bible applications. Whether you use an iPhone, Android phone or one of the many other types of smartphones, you can easily get access to a Bible. One such program that works on almost all the various platforms is YouVersion. Once the application is downloaded you can access the text of the Bible any time you would like to read God’s Word. Where To Get A Free Bible? There are several Bible societies that help distribute or make available free Bibles. It depends on which country you live in as to which Bible society you should contact. A few of them are the American Bible Society, International Bible Society (also known as Biblica) and United Bible Societies. They seek to distribute God’s Word to specific people groups and organizations. The Gideons won’t usually give Bibles to individuals. But if you are looking for Bibles for distribution purposes and have a qualifying organization, they will give you cases of Bibles to give away to others. At the Gideons’ website you can get information to contact a local Gideon who can help you with obtaining Bibles. 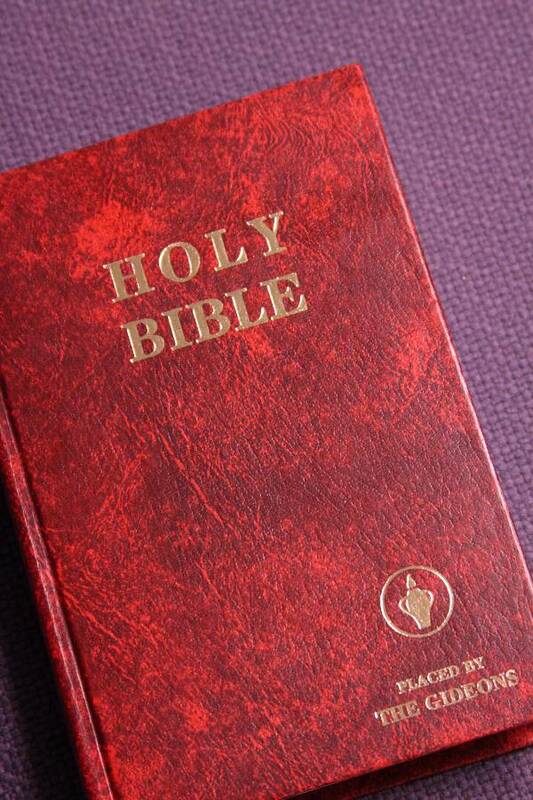 You can obtain a Bible from a hotel. The Gideons are the ones who place them there. Gideons are businessmen who personally purchase or raise money to purchase Bibles to distribute to doctor’s offices and hotels. The hotel does not pay for the Bibles, therefore you are not stealing from anyone to take one of these Bibles. However, you should let the hotel know if you take a Bible so that they can have it replaced for the next guest. The Gideon Bibles that are found in hotels are good quality, durable Bibles—if you have one it will probably last you many years. Please do not take more than one. About a year ago I was involved in a Gospel video distribution project. I recently heard of someone calling the organization I was working with to ask for more information about salvation. The person got saved as a result of a free DVD presentation and a phone conversation. I have no idea if the DVD the person received was from me or one of my 33 teammates; but, I can assure you that hearing the story of someone getting saved almost a year later as a result thrills me as I write about it. If you obtain a Bible through any of these methods and it is a help to you spiritually, you should write or call the organization that provided the Bible and let them know. They will be blessed to hear of the spiritual help they were to you. Hello Godwin. Our ministry is self-supporting and we are not in a position to help you because our ministry does not have any funds to help you. All we can do is pray for you and your ministry. Prayer is free…if God wants a ministry to succeed, He will make sure to send His provisions because God will never ask you to do something that He doesn’t ensure it can be done. My prayers are for you my friend. Another good resource for free digital and print Bibles is http://www.getfreebibles.com. They have different versions to choose from. Hello Eric. Our ministry is self-supporting and we are not in a position to help you because our ministry does not have any funds to help you. All we can do is pray for you and your ministry. Prayer is free…if God wants a ministry to succeed, He will make sure to send His provisions because God will never ask you to do something that He doesn’t ensure it can be done. My prayers are for you my friend. Yes God is the provider and that is why he will use you to provide the free bibles.The word of God should be free of charge.In the book of Acts,the people helped other Christians to promote the Gospel.I will pray that the Holy Spirit convict you to provide the free bibles to these people,including myself.I run the Youth department of 50 children in the Church and hope to receive these bibles before Christmas because the word of God is the best gift to give a child. Hello friend. It’s not a matter of my willingness or our website’s wanting to be we do not recieve outside support or financing to do such a thing. We recieve hundreds of reqeusts and this would total thousands and thousands of dollars, which we do not have. Our ministry is self-supporting and we are not in a position to help you because our ministry does not have any funds to help you. All we can do is pray for you that God will supply the Bibles. Hello Mr. Gitonga. Please re-read this article. We do not have funds to send out Bibles. Please access the resources you read in this article. I am sorry and wished we could help you sir. Our ministry is self-supporting and we are not in a position to help you by sending you Bibles because our ministry does not have any outside funds to help you. All we can do is pray for you and that God will provide you with Bibles. To further refine your notes about the Gideons. YES, we do give individuals bibles and testaments for free! We, as Gideons, ourselves purchase and try to keep with us at all times a small supply of “Personal Worker’s Testaments”. Where the confusion comes is when someone wants to get cases of bibles to distribute themselves. Our mission is to put the Word of God in people’s hands and to be used of God to win them to a saving knowledge of Jesus Christ. We feel that the best way to do that is for us to physically place the Bibles ourselves. (exception – US military chaplains). If you want a bible for your own use, just about anywhere in the world, find a Gideon and he will make sure you get one. If you cant find one, check http://www.gideons.org, and they will help you contact the nearest “chapter” for a referral. Hello friend. Our ministry is self-supporting and we are not in a position to help you because our ministry does not have any funds to help you. All we can do is pray for you and your ministry. We do not recieve outside donations for this sort of thing. I am so sorry that we could not help you.